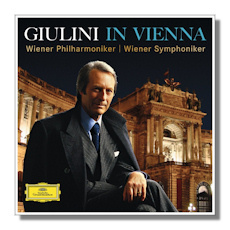 This box gives you Giulini's recordings in Vienna, both with the city's Symphony and Philharmonic. It's a credit to the great conductor that you can't really tell much difference between the two orchestras, and a credit to Universal Music for giving us such a complete set. All of these recordings testify to Giulini's unique artistry, and in a few cases, some surprising diversity. To summarize, the Beethoven concertos with Michelangeli are a compelling document of a partnership that works better than expected. The highlight is clearly the "Emperor" which finds the Vienna Symphony in particularly fine form, and the reclusive pianist also on his best behavior. While much of his output is cited as controversial, I take no issue with these large-scaled and big-hearted live renditions. Since the 1st and 3rd are still on DG Originals, it's good to have all of these together at last. Similarly, the Liszt disc with Lazar Berman are very weighty and unusually dark. The Vienna Symphony again plays handsomely, and Giulini works very well with Berman. This is similar in approach to Arrau; if you like that kind of seriousness over flair, you will enjoy this. Berman flies solo for the disc's final selection, unusual in a collection devoted to a conductor. The generous selection of Brahms is not as artistically rewarding. While in the symphonies the Vienna Philharmonic sounds lovely throughout, Giulini's ever-sober approach to Brahms is heard to better effect in Chicago and Los Angeles. Here, the music droops too much for my liking, though again the playing is amazing. There's literally no question that Giulini was a superb Brahms conductor, but these simply aren't among his finest recordings. The German Requiem is arrestingly sung and (typically for this conductor) very devotional. Pay no attention to Amazon reviewers who claim this is from 1995, it's a 1987 reading that has some very special moments. Giulini goes slowly, but the choir manages well, and the overall result is fairly moving. The Bruckner recordings have – as far as I know – never been packaged together, but they are uniformly excellent, and show Giulini at his absolute best. They are gloriously played throughout, with the brass of the Vienna Philharmonic sounding magnificent. Perhaps this 8th has been overshadowed by Karajan's valedictory performance with this same orchestra and label, but this is just as moving a vision. The 7th and 9th are also exceptionally distinguished, with the 9th being sufficiently different from the conductor's Chicago EMI version to merit serious investigation of both. The 7th is both flowing and glowing, and outclasses Karajan on DG (his EMI Bruckner is typically better). That leaves an excellent – and very edgy – Rigoletto and the von Einem curio. In the Verdi, I find all involved to be in fairly excellent voice, but aside from Domingo (who sounds amazing) Giulini is the real star. So many recordings of this opera are blandly conducted to the point of indifference, but that's not an adjective that was ever in Giulini's vocabulary. He leads his singers in a very humane and sincere version of the work, highlighting the underlying darkness and tragedy. Finally, the set concludes with von Einem's To Prosperty, a cantata that Giulini premièred in 1975. It was unusual for this conductor to record such contemporary music, and as far as I know this is its first CD release. To be honest, I don't know much of the composer's music, and more to the point I have never heard Giulini in something so "modern". I can see what drew the conductor in; there's lots of big, pseudo-reverential outbursts from the chorus, and it settles down after a noisy opening into a rather old-fashioned sounding choral work. Of course it has its weirder moments, but Giulini directs with such seriousness that you know he must have believed in it. Truthfully, that belief shines through all his work, which is why this set is worth hearing, even for the pieces that aren't top choices.